What does 🤑 - Money Mouth Face Emoji mean? Ka-ching! 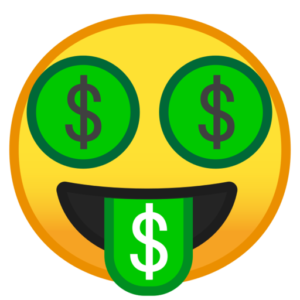 This emoji is all about the green: a typical round emoji face with dollar signs for eyes and a green bank note for a tongue. There are a number of emoji available to express ideas related to all things money in texting and social media. The classic money bag emoji is nice, and the straightforward bank note emoji gets the job done, too. Most of the emoji appeared around 2015, which seems like a long wait, considering how popular they are. And then, there’s the money mouth face emoji which was approved as part of Unicode 8.0 in 2015 as well and added to Emoji 1.0 in 2015. This emoji makes light of the money-factor, as the smiley face is literally spewing money from its mouth. We’re not really sure of the intent here … but we’re guessing people needed an emoji that showed a love of wealth or an extreme involvement in money. People using the money mouth face emoji are usually looking for a way to express a love or appreciation of money … or a consuming desire for money. Sometimes, it points to a way of life improvement and is often used in reference to the job market, money-making, banking, and cryptocurrency. Sometimes a little money goes a long way.